Ultram is a brand name drug for pain relief. Compared to other drugs containing the same active ingredient (Tramadol Hydrochloride), it is relatively more popular than the other brands. The brand Ultram is from the manufacturer called Ortho McNeil, which is now a part of the massive company Janssen Pharmaceuticals. This drug was introduced in the market in 2002, but since its patent has already expired, the Ultram is already with a number of generic competitors in the market. Generic medicines of the drug Ultram (from manufacturers like TEVA, Sandoz, Watson, Mylan, and others) also contain the same active ingredients as the brand name product. Although Ultram was first in the market, its existing generic counterparts are still as reliable and as potent as the brand drug, since generic and brand Ultram contain the same active ingredients. Patients can expect the same Ultram-like effect from the generic counterparts since generic medicines are made identical to the brand name products—they wouldn’t be classified as generic medicines if they function otherwise. What is Tramadol Used to Treat? Brand and generic Ultram products are indicated for moderate to severe pain use. Tramadol products are classified as narcotic-like pain relievers, which mean that they work by binding to opioid receptors in the body that control pain. Because of this mechanism, narcotic-like medicines have great potential for addiction, physical dependence and abuse and are considered as controlled/scheduled substances by law. Tramadol is an effective pain reliever for chronic pain and surgery-related pain management. Technically, the drug Tramadol is used for round-the-clock treatment of pain, so it’s not recommended for patients with an as-needed use for pain relievers. Patients are advised to contact their health providers when they experience symptoms of serotonin symptoms like hallucinations, fever, agitation, fast heart rate, twitching, loss of coordination, and muscle twitching. According to the online information for Tramadol, serious side effects of the drug are more pronounced in the elderly and in patients who are debilitated, malnourished, or overweight. Tramadol interacts with medicines like other narcotic drugs (opioid pain relievers and cough medicines), sedatives (Valium and similar drugs), serotonin-acting medicines (usually medicines for depression, migraine, etc. ), and medicines that help slow the breathing or make one drowsy (tranquilizers, antidepressants, sleeping pills, and others. Tramadol is a prescription-only medicine and may not be purchased over the counter. Tramadol may negatively affect patients with the following medical considerations: liver disease, renal disease, seizure disorders, and alcohol and drug dependence. Since the product Tramadol is considered a narcotic-like pain reliever, online pharmacies are careful not to stock the product to avoid rifts with international law enforcement agencies. Because of Tramadol’s prescription status, it is hard to find legitimate online pharmacies with prices for Tramadol online. According to the prices for the brand name drug for Tramadol, buyers can purchase Ultram for at least $5.37 at famous drugstores like Walmart, Walgreens, CVS Pharmacy, and Kroger Pharmacy. Of course, buyers should be able to provide their prescriptions in order to purchase Tramadol Ultram 50 mg from these locations. The price discrepancy between brand and generic Ultram at local pharmacies is not too great, but buyers can choose the generic counterparts so they can save more in drug costs. 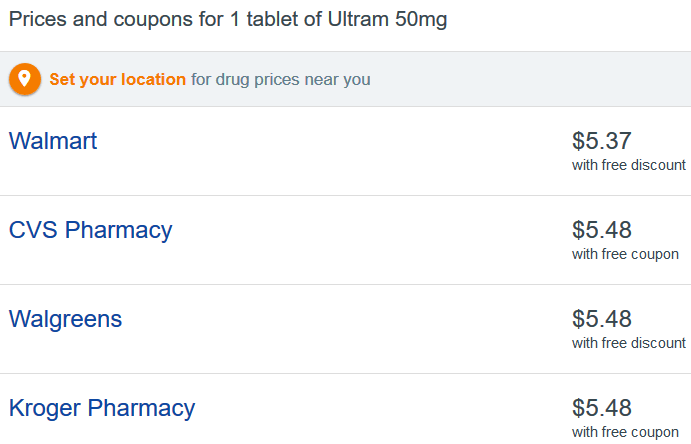 According to the price details for generic Ultram on the same online platform, customers can purchase the generic counterparts for as low as $1.13 per tablet depending on the local drugstore buyers will use. Generic Ultram Online: Can I Purchase Tramadol without Rx? 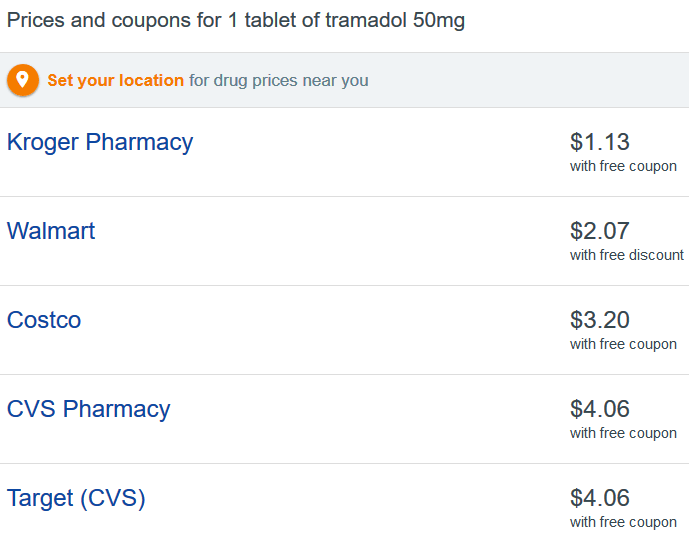 There are online pharmacies offering Tramadol even to consumers without prescriptions. However, it is illegal to purchase Tramadol online without Rx—consumers can face legal charges and operators will face litigation when caught. Despite the legal status of Tramadol sales online, customers still pursue the purchase of the medications because of their perceived need for the product. Some clients research on stores offering off the books Tramadol because they think they need the drug but their doctors have already given up prescribing the drug for them because of the possible risks. Although consumers may be able to find online drugstores selling Tramadol at cheap prices online and without Rx, they should be informed that purchasing and using Tramadol without Rx come with a price, and often it’s one that consumers are likely to pay health-wise. Ultram is the brand name drug containing Tramadol and it’s one of the most popular drugs for moderate to severe pain relief. Since the patent for Ultram has already expired, the market is now teeming with generic alternatives for the product. Even if Tramadol products are relatively inexpensive, consumers are still looking for online sources for this medication because not everyone is prescribed the drug. It is illegal to purchase Ultram (generic or not) online and without Rx, so make sure to consult your doctor before purchasing the product.